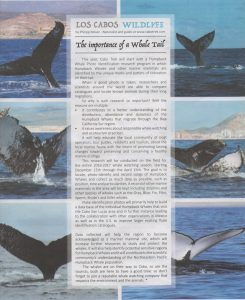 This year, Cabo Trek, as one of the few if not the only company in Cabo San Lucas, will start with a Humpback Whale Photo Identification research program: Humpback Whales and other marine mammals are identified by the unique marks and patters of coloration on their tail. 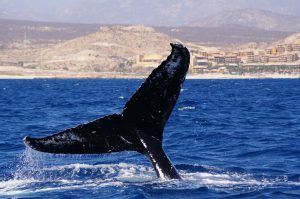 When a good photo is taken researchers and scientist around the world are able to compare catalogs and locate known animals during their long migrations. 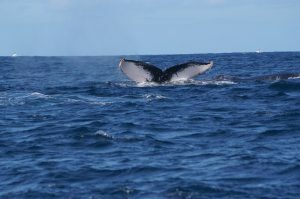 It will help educate the local community of boat operators, tour guides, residents and tourists about the local marine fauna with the intent of promoting lasting changes toward preserving and conserving a healthy marine ecology. 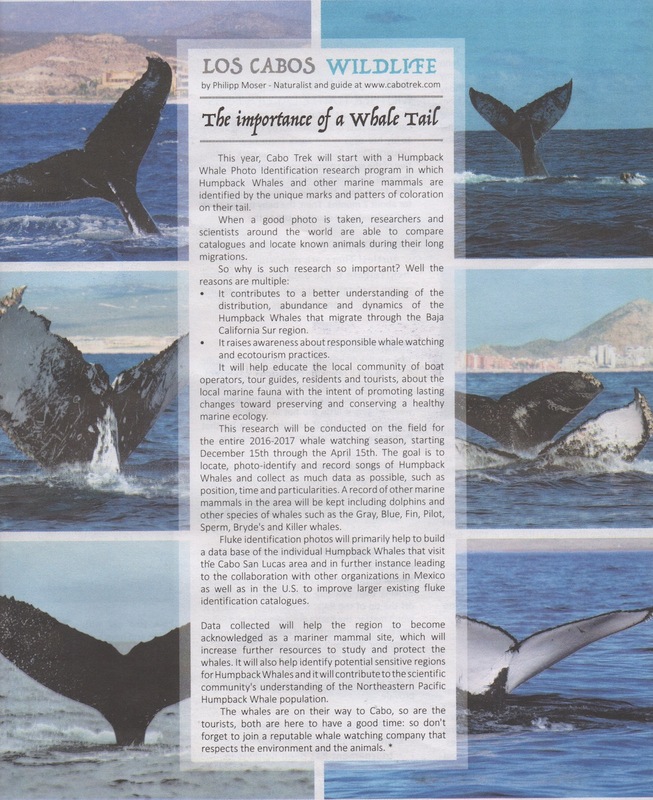 The opportunity for Cabo Trek guests, is to see how research is conducted on the field for the whole 2016-2017 whale watching season, starting from December 15th till the e15th of April. 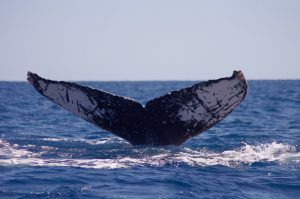 The goal is to locate, photo-identify and record songs of Humpback Whales and collect as many datas as possible such as position, time and particularities. 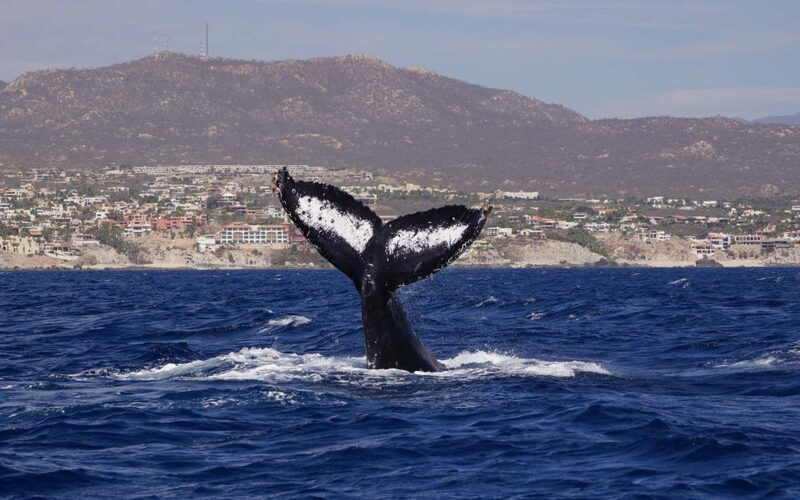 It is in our intention to raise awareness regarding whale watching practices and Humpback Whale behavior by outreaching to the local Cabo San Lucas community in terms of educational programs, with special focus on the younger generations, that will take place in schools. 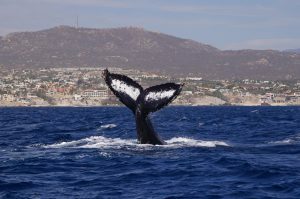 The whales are on their way to Cabo, so are the tourists, both are here to have a good time: so don’t forget to join a reputable whale watching company that respects the environment and the animals.